The Exo Terra SunRay Fixture’s stylish looks suits all kinds of terrariums and integrates into any living room. The SunRay Metal Halide Bulb is an all-in-one bulb that combines very high light output and heat radiation with optimal levels of UVA and UVB. The Exo Terra SunRay delivers a consistent spectrum, which closely matches that of natural sunlight, contributing to the animal’s overall wellbeing. The combination of the correct wavelength UVB and heat enables the animal to produce it’s own vitamin D3 for proper calcium absorption and to prevent metabolic diseases (e.g. MBD). 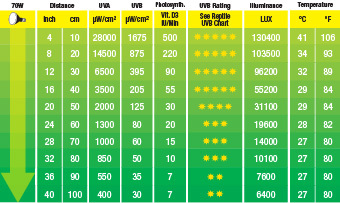 The powerful light output and the balanced UV rays stimulate the appetite, breeding behavior and the overall health of reptiles. The aluminum facetted reflector produces an evenly distributed light beam. Aluminum dissipates heat very effectively, resulting in a longer lifespan and a more stable operation than glass reflectors. The Exo Terra SunRay can be used as a sole light source. For use with PAR 30 Type Metal Halide bulbs only (e.g. Exo Terra SunRay). The Exo Terra SunRay is an all-in-one bulb that combines very high light output and infrared heat radiation with optimal levels of UVA and UVB. 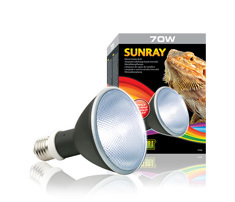 The SunRay is available in lower wattages and can be safely used on smaller terrariums. The Exo Terra SunRay delivers a consistent spectrum, which closely approximates that of natural sunlight, contributing to the animal’s overall wellbeing. The combination of the correct UVB wavelength and heat enables the animal to produce it’s own vitamin D3 for proper calcium absorption and prevents metabolic diseases (e.g. MBD). 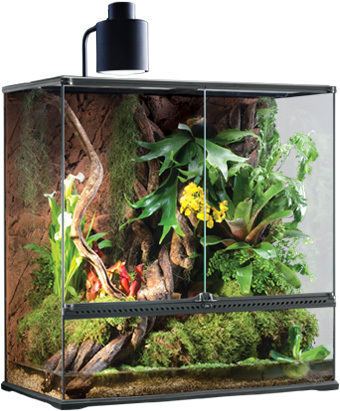 The powerful light output and balanced UV rays stimulate appetite and breeding behavior, while improving the physiological health of reptiles. The aluminum facetted reflector produces an evenly distributed light beam. Aluminum dissipates heat very effectively, resulting in a longer lifespan and more stable operation than glass reflectors. The Exo Terra SunRay can be used as a sole light source. To obtain maximum results and safety the bulb should be used in conjunction with the Exo Terra SunRay Fixture.